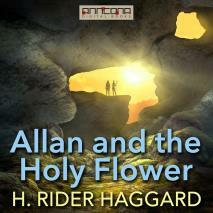 Allan and the Holy Flower is an adventure novel, part of the Allan Quatermain series, by E. Rider Haggard first published in 1915. This is number 7 of the 14 books that H. Rider Haggard wrote - starting with "King Solomon's Mines" - depicting the adventures of Allan Quatermain, great English hunter in the wilds of mysterious Africa. Brother John, who has been living in Africa for many years, gives Allan Quatermain the largest orchid he has ever seen. Later, in England, he has a meeting with Mr. Somers, an orchid collector who is prepared to finance an expedition to search for the plant. Join Allan as he sets out to find this rare orchid ... and finds something more. The expedition for the very rare orchid, also come sto including the search for the kidnapped wife of one of Quatermain's friends. The Holy Flower (known as Allan and the Holy Flower in America) first appeared serialized in The Windsor Magazine from December 1913 to November 1914. Total Running Time (TRT): 11 hours, 11 min. Reading by Lainey Ben. Sir Henry Rider Haggard (1856-1925) was an English writer of adventure novels set in exotic locations, predominantly Africa, and a founder of the Lost World literary genre. Haggard's stories are still widely read today. Haggard's Lost World genre influenced popular American pulp writers such as Edgar Rice Burroughs, Robert E. Howard, Talbot Mundy, Philip José Farmer, and Abraham Merritt. Allan Quatermain, the adventure hero of King Solomon's Mines and its sequel Allan Quatermain, was a template for the American character Indiana Jones, featured in the films Raiders of the Lost Ark, Temple of Doom, Indiana Jones and the Last Crusade, and Kingdom of the Crystal Skull. Quatermain has gained recent popularity thanks to being a main character in the League of Extraordinary Gentlemen. Log in to borrow this title and view current loan status.